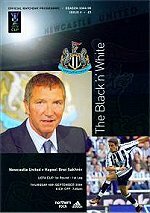 Newcastle qualified for the UEFA Cup by League position having finished 5th in the Premiership in 2003/04. Newcastle won the Group and qualified for the knock-out stages of the competition. Full Group results and table.